Death Before Glory! 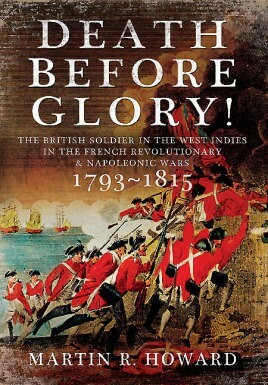 is a highly readable, thoroughly researched and comprehensive study of the British army’s campaigns in the West Indies during the French Revolutionary and Napoleonic period and of the extraordinary experiences of the soldiers who served there. Rich in sugar, cotton, coffee and slaves, the region was a key to British prosperity and it was perhaps even more important to her greatest enemy – France. Yet, until now, the history of this vital theater of the Napoleonic Wars has been seriously neglected. Not only does Martin Howard describe, in graphic detail, the entirety of the British campaigns in the region between 1793 and 1815, he also focuses on the human experience of the men – the climate and living conditions, the rations and diet, military discipline and training, the treatment of the wounded and the impact of disease. Martin Howard’s thoroughgoing and original work is the essential account of this fascinating but often overlooked aspect of the history of the British army and the Napoleonic Wars. Dr Martin Howard, a hospital consultant and Fellow of the Royal Colleges of Physicians and Pathologists, has a longstanding interest in the Napoleonic Wars and has lectured and written extensively on the subject. He has made a special study of the British army’s less-well-known campaigns of the period, and his most recent book in the field is Walcheren 1809: The Scandalous Destruction of a British Army.